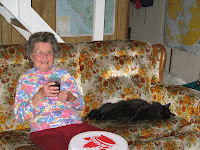 Mom and "her cat" Stick Tail have been coming to visit us in Powell River for the last four years. We all pile into Mom's car, lovingly called Bertha, and take the short (about 240 kilometres) but long (two ferris and 7 hours) trip. Riding in a car isn't Stick's favourite thing (you can hear his protests from quite a distance), but he finally relaxes on the back seat, sleeping most of the way. The highlight of the trip north is visiting the float cabin. Stick has to stay in his carrier for the boat ride up the lake, but gets lots of comfort on Mom's lap. Once at the cabin, he settles right in. The beauty of the float cabin is that it is surrounded by water. Back in Bellingham, Stick has to stay indoors all of the time because Mom has an apartment style condo. But at the float cabin, he's able to have the run of the place. For Stick, the cabin is like a giant cat climbing apparatus. He loves the stairs (the first he has ever known) and gets a kick out of running up and getting a "birds-eye" view from the loft. At first, he was very cautious outdoors, but now he is comfortable in his vacation home. He even explores underneath the float (that's where the mousies live). One trip he did give us quite a scare. He hopped the floating logs to shore and started climbing our cliff. But a few good warning shots with rocks brought him scurrying for home. I'm always amazed at how quick Stick Tail adjusts to new environments. After only a few hours inside the cabin, he is allowed undisturbed exploration. Usually after one day he has a favorite sleeping place. And the litter box has always been found without any "accidents." 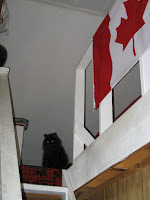 A friend warned me that cats don't adjust to new places very well, but Stick has done exceptionally well between his three homes: a condo in Bellingham, a condo in Powell River, and a float cabin up the lake. Our cabin on Powell Lake is a very special place for all of us. It even inspired my husband Wayne to write the Coastal BC Stories series. You too can head Up the Lake and Farther Up the Lake through his books. We'll all be lounging in the sun and swimming in the lake (well, maybe not Stick unless he falls in) for a few glorious days, so you won't be seeing any blog posts for a while. You'd think I'd have more time for reading during long winter nights, but it's during the summer when I read the most. Here's another Coastal BC suggestion. 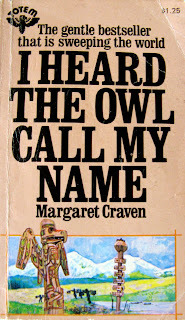 I Heard the Owl Call My Name by Margaret Craven was written in 1967 and has become a classic piece of Canadian literature. The used book I purchased (from a 1975 reprinting) came from the now closed Max Cameron Secondary School in Powell River. It's book #12 from a classroom set and was checked out to only one student, L. Sieg. That's almost as interesting as the book itself. 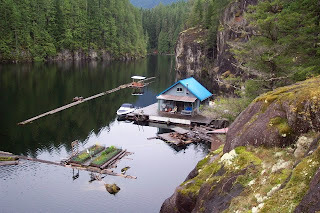 The story takes place in a remote village up the river at the head of Kingcome Inlet. Located near the Inside Passage of Coastal BC, it was a land of First Nations peoples, loggers and fishermen. The period wasn't specified, but based on facts in the book it was probably set in the early 1950s. Up until then, Mission Boats brought religious and medical services to remote communities. Churches were also built in settlements to convert and assist their inhabitants. In some cases, the people sent were a good match, in others, a detriment. The characters in this story run the gamete from the long enduring Kwakiutl villagers, an uncaring teacher, the arrogant anthropologist, by-the-book RCMP officers, unscrupulous traders, to the patient young vicar. 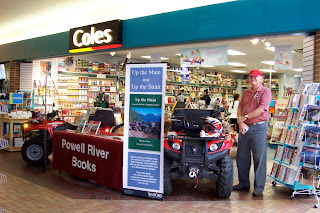 I Heard the Owl Call My Name is the story of Mark Brian, a new vicar with the Anglican Church who was sent to far-off Kingcome Inlet. Unknown to Mark, he has a terminal illness that leaves him only a few years to live. His Bishop sends him to Kingcome Village to learn about life in a short time, and he does. The book is only 160 pages and can be easily read in a day. But I enjoyed taking longer to savour the content and think about some of the profound messages. And it's worth reading more than once like I did. A Kwakiutl Village and School from 1967 by Harry F. Wolcott is the book version of his dissertation on the study of a Kwakiutl Indian village and its one-room school. Heart of the Raincoast: a life story from 1998 by Alexandra Morton and Billy Proctor is about the life of legendary Billy Proctor who lived through the heyday years of Coastal BC. Full Moon, Flood Tide from 2003 by Yvonne Maximchuk and Billy Proctor continues the story of Billy Proctor's life. 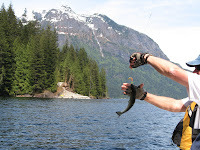 Inside Passage: Living with Killer Whales, Bald Eagles, and Kwakiutl Indians from 1997 by Michael Modzelewski who spent 18 months in the wilderness on Swanson Island with local Will Malloff. 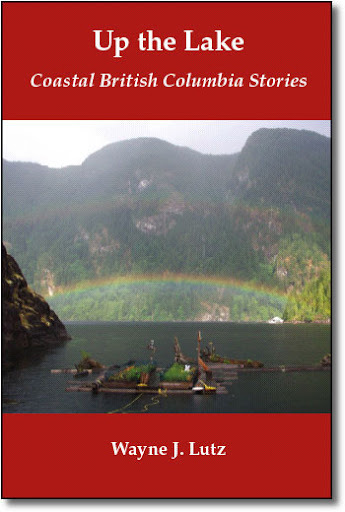 Talking in Context: language and identity in Kwakwa_ka_'wakw society from 2005 is a case study of the use of the Kwak'wala language and cultural identity in two Coastal BC First Nation communities, Quatsino and Kingcome Inlet. A Curve of Time from 1968 by M. Wylie Blanchet and Timothy Egan is the classic memoir of a woman and her children as they explore Coastal BC summer after summer in a 25' boat in the 20s and 30s. 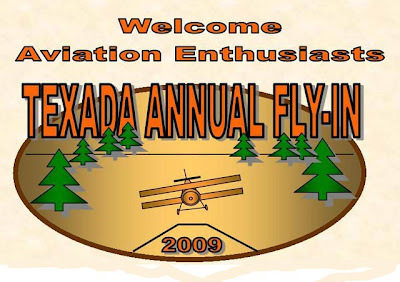 The fly-in will have lots of activities for pilots and non-pilots alike. Pilots can come and stay at the airport campground for a weekend of fun. Everyone is invited for the festivities on Sunday. Just looking at the planes and talking to the pilots is well worth a visit. With all the hard work by Doby and the other planning committee members, it's going to be another outstanding year! On Saturday night, July 24, there's a Fly-in Fling at the Royal Canadian Legion. Then on Sunday morning, the gates open at 8:45 and a pancake breakfast will kick things off at 9:00 am. That will be followed by displays, presentations, live entertainment, games for kids and a lunch BBQ at 12:30. Bring a folding chair or grab a place on the grass for aerial demonstrations. The highlight of the afternoon will be the Fraser Blues Flight Team. 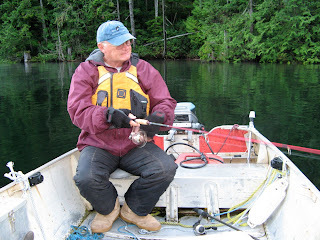 As I've mentioned before, this has been the best year for fishing on Powell Lake. At the end of a warm summer day, you'll find Wayne and I out in our tin boat trolling through First Narrows and out into the main lake. I don't think our new fish finding toy has had anything to do with our recent success, but it hasn't hurt either. 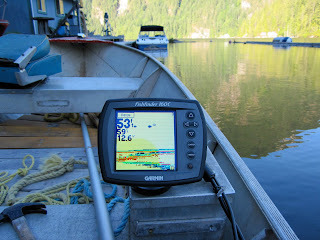 We purchased a Garmin Fishfinder 160C to help guide us to likely spots. It's full colour display is easy to read and gives us information about depth, water temperature, and the bottom structure. It also displays images of cute little fish swimming below the surface. Dark ones are below the boat, outlined ones are swimming nearby. Don't ask me how that works, magic I guess. From April through late-July you can find Pale Tiger Swallowtail Butterflies in British Columbia. I see them most often flittering around our cabin on Powell Lake in June and July. They are an impressive, large butterfly with a pale yellow background and heavy black "tiger" stripes. They like hilly woodlands near streams and water. Powell Lake fits that perfectly. There's something comforting about the way seasons march through in a similar manner. After nine years living up the lake, we kind of know what to expect. Each spring and summer I look forward to the return of our animal and bird friends. Will they be early? Will they be late? The weather has a lot to do with it. This year we had a cold spring and late start to summer. Plants, bugs and birds were a bit late in arriving. The same for Buster. Buster is our name for the garter snake who comes to our cabin each year. I'm not sure if it's Buster himself, Son of Buster or Buster the III, but every year there's one garter snake that hangs around our float cabin. Just after I saw Buster for the first time last week, I saw a huge bullfrog polliwog. Every animal must have a food source, and frogs are Buster's #1 choice. Garter snakes also eat worms, fish, small birds and rodents. Buster likes to sun himself on our transition float to shore or my garden float. He is so "tame" you can walk within a few feet, at least when he is lulled to sleep by the warm sun. Garter snakes are common non-venomous snakes in Canada and the U.S. They have yellow stripes on a brown body and grow to 1.5 metres (3.5 ft) in length. They like to live near water and are semi-aquatic. Buster often swims in our natural swimming pool or across our front "water" yard. His body undulates from side to side, propelling him gracefully through the water with his head held high. I grow Snow Peas in half of a 55-gallon plastic barrel drilled for drainage. This is my second year and I've made some improvements. Last year, my homemade wood and string trellis couldn't handle the weight of the fully grown plants. This year, I found a metal trellis at Canadian Tire for $19.99 that would fit inside just fine. 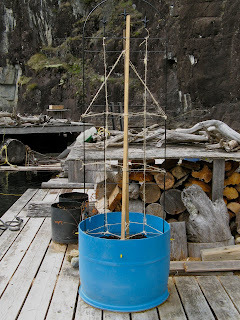 To that I added some extra wood stakes and twine for climbing and plant support. Now the Snow Pea plants have grown all the way to the top of the trellis, and it's sturdy nature is holding them up just fine. Along the way, I've had to use twine to gently tie the tall stalks to the trellis to give them some additional support. They are very fragile, so I had to be very careful. One good thing about peas in a barrel is I can walk all the way around for picking. The only difficult ones are at the top. I have to stand on my tippy-toes or call Wayne to reach them for me. So far we've had two pickings. We like to wrap the pea pods in foil pouches and put them briefly on the BBQ grill. About 5 minutes on each side is plenty to steam them to a crisp doneness. And of course, they are great raw in salads and added to a stir fry. When I return to Powell River from Bellingham via Pacific Coastal Airlines, I take the last flight of the day. This time of year, that means some pretty spectacular inflight sunsets. Recently, we were out of bread at the cabin and didn't plan on going to town in the near future. In the winter, I bake bread with the help of my wood stove. On a warm summer day, I didn't want the extra heat. What to do? I looked at my cast iron dutch oven and thought it might do the trick. I mixed up a batch of Sourdough Wheat Bread dough. When it was time to put it in a warm place to rise, I heated the dutch oven on top of the stove. Once the metal gave off a nice warm glow, I turned the burner off and put my covered bowl of dough inside on top of two hot pads. I gave the metal lid an extra shot of direct heat and placed it on top. Now I had a warm "oven" to get the yeast working. I had to reheat the lid several times to keep the temperature warm enough inside. It did take a bit longer than usual to get the dough to double in size. When it was ready, I punched it down, kneaded it and placed it in a bread pan for a second rising. I reheated the dutch oven and lid before placing the pan inside, again protected by two hot pads on the bottom. You may be wondering why I didn't just use my oven. Because it runs on propane, it gets very hot. Also, I have to lift out the bottom panel to relight the pilot every time I turn it on. And then there was the whole experimental process. I love finding new ways of doing things. In the end I had to heat up the oven on to bake the bread. But in less than half an hour I had a nice loaf to tide us over until our next trip to town. Didn't it turn out nice? Last May, I shared how Wayne and I were giving our Barn Swallows a helping hand with their nest building. Older nests have fallen twice, so we gave them a little shelf up under the eves to use as a support. In June, I shared about how the returning pair immediately set up housekeeping and started a new nest. Last week we saw the heads of two babies. Both Mom and Dad bring tasty bugs back to their fast growing chicks. We call daddy Bert. He's a slim dude. When he isn't eating and gathering bugs for his babies, he sits nearby and seranades his lovely lady on the nest. I have read that pairs mate for life. I like the thought of Bert and his Lady coming back each year to share their babies with us. When I got back to the cabin last week, Wayne had a surprise for me. 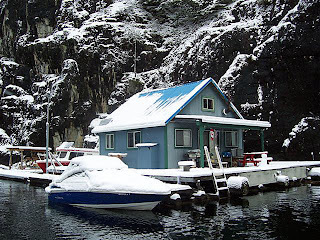 Our float cabin on Powell Lake, was featured twice in a new book called Our Canada: Picture Perfect. What an exciting surprise! Of course, our off the grid cabin is a prominent feature in Wayne's Coastal BC Stories, but being included in a book published by someone else is very exciting. Two summers ago, Wayne wrote an article for Our Canada Magazine called "On the Lake". It was the first story in a series called "Our Dream Home." We were proud to start it off for them, and got lots of great feedback from the magazine's readers. The article included two pictures of our cabin. 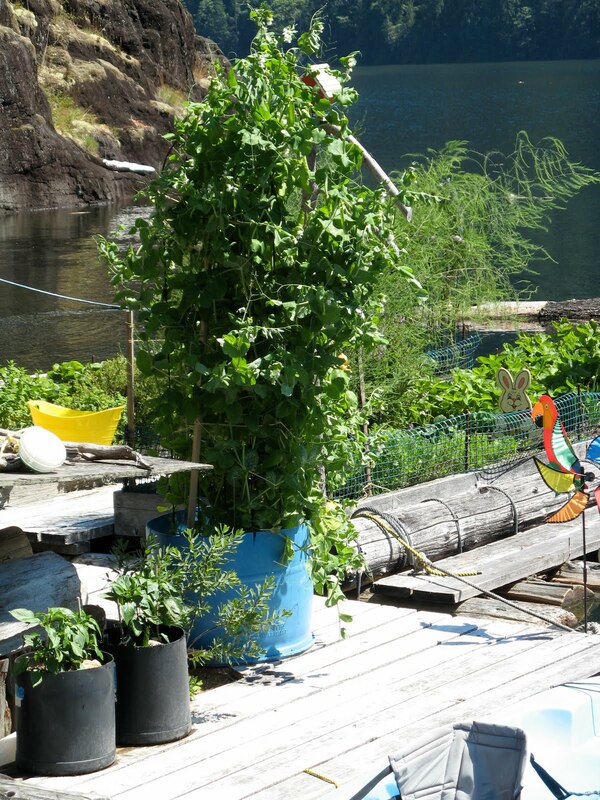 The first was a summer scene with my floating garden in the foreground and our floating wood shed tied to the log boom. This is one of my favourite shots. 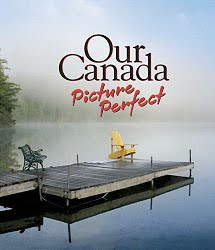 You'll now find it in the British Columbia section of Our Canada: Picture Perfect. The other picture they chose to include in the book was a winter scene. Because our Campion runabout was tied to the cabin deck, it was placed in the boating section. 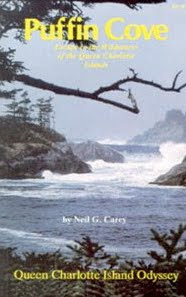 The book I just finished reading was Puffin Cove: Escape to the Wilderness of the Queen Charlotte Islands (Hancock House, 1982). Neil Carey and his wife Betty (an adventurer in her own right) went looking for a remote place to live and build a wilderness cabin. They first found their paradise on Moresby Island in Haida Gwaii in 1955 while on a boat trip. They sold their home in California (sounds familiar to me) and built a cabin in 1964 on property they purchased in Sandspit. They started as "Summer Settlers" (also a familiar ring) until they immigrated to Canada to live there full time in 1965. Next came the building of their remote cabin at Puffin Cove on leased land on the southwestern tip of Moresby Island. Neil recounts life on Haida Gwaii in a different time. Logging and mining were bigger industries, but already starting to decline. No regular ferry service to the mainland made life more isolated and simple in many ways. Neil takes you gyppo logging, hunting, fishing and boating in fair weather and hurricane force storms. You get to meet the people that made their homes on the islands to live a good, but hard life. It must have been something to see wild storms raging on the open ocean from their snug cabin on the protected cove. Today, it is part of the Gwaii Haanas National Park. My cabin kitchen has everything I need to cook a great meal, but it's a bit different than a town kitchen. Take a look at some of my unusual cooking utensils. You might use an oven thermometer, but what about those other items? Can you guess their purpose? Here's a picture of my stove. Maybe that will give you some hints. I use the lighter most often. Because it's a propane stove, I use it to light both the burners and oven pilot light. I was afraid of propane to begin with. Now I would say I have more of a healthy respect. Speaking of the oven pilot light, that's where the pliers come into play. It's not safe to let it stay on when the oven is not in use. Consequently, John installed a control valve on the side. It's tight to prevent leakage, so I find using pliers makes operation easier. I like gas for stovetop cooking. You have great control. The oven is a whole different story. Propane is much hotter than natural gas. That means the temperature control knob has no relationship to the actual temperature in the oven. That's where the oven thermometer comes in. And without any electricity, a flashlight shining through the glass door becomes my oven light. The other day, Wayne and I heard the cry of a loon, but it didn't sound just right. Where we live, the typical species is the Common Loon. At a distance, the body shape was the same. But as he came closer, I noticed a big difference in the colouring. The Common Loon is black and white. This bird was more gray and white, and had a brick red throat. I looked it up in my guide and discovered it was a Red-throated Loon. The head of Powell Lake was the scene of extensive logging in years past. In the heyday of MacMillan Bloedel, there was a large camp there to house loggers. When we visited last December, the old shops were still standing. When we arrived last week, everything was torn down and the ground bulldozed. The docks and log pens are still there, but for how much longer? One lone logging truck remained, a last testament to times gone by. A hike up the logging road towards the old camp was a sad reminder that times change. I have two small strawberry patches in my floating garden and they are producing like crazy. That's probably because I planted a new bed last year, and replenished the other bed with established runners in the spring. In another few years, I'll need to relocate the older bed as well. What tasty treat could I make with all those berries? Why not a fresh strawberry pie. Mix flour and salt. Cut in shortening until it's crumbly. Stir in water slowly until the dough forms a ball. Wrap and chill before rolling out. Place in an 8" pie pan, trim to 3/4" then flute the edges. Prick the bottom and bake at 350 degrees for 20 minutes. Prick bottom again (if needed) and continue to cook until golden brown. Let cool. Cabin Baking: Strawberry Rhubarb Pie - Oh My!